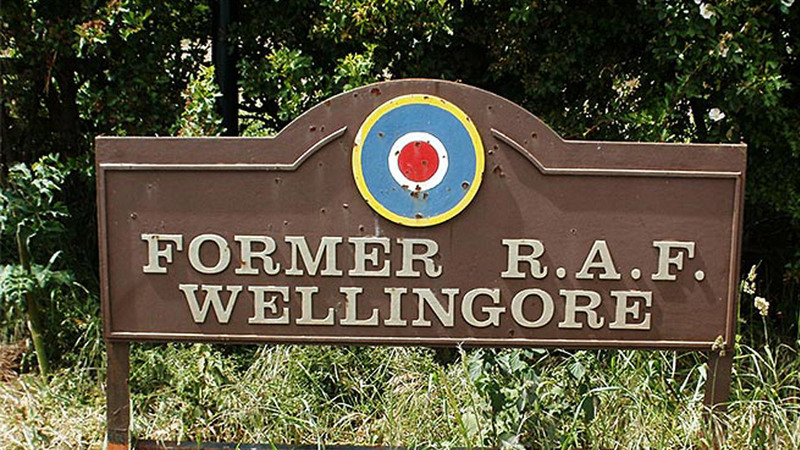 The site of Wellingore Airfield lies approximately one mile south of Wellingore village. It was first used in late 1937 as a RLG (Relief Landing Ground) for Cranwell. The site was expanded at the outbreak of WWII, with the provision of a conctrete perimeter track, eight blister hangars, six fighter ‘E’ pens and defensive pillboxes. A small technical site was established at the north-west corner of the airfield. The airfield changed roes when 29 Squadron and 46 Squadron arrived from Digby with Blenheims and Hurricanes respectively, and were operational during the Battle of Britain. Following the Battle, a variety of fighter units were rotated through the airfield until April 1944. However, during this period, aircraft from 11 SFTS (Service Flying Training School) used Wellingore briefly, in 1941. Following cessation of fighter operations, the airfield reverted back to a RLG for RAF Cranwell until closure in late 1945. Today the airfield has returned to agriculture. Some ‘E’ pens survive, as does most of the perimeter track and some pillboxes, including the battle headquarters. Of the communal and accommodation sites, a few structures exist in private woodland.